Red-bellied woodpeckers are resident birds that live in their territory year round. They do not migrate like south for the winter like some birds. They are a bird of the eastern United States and have been expanding their range north. The Red-bellied woodpecker is a Cavity Nesting Bird. Being woodpeckers they can excavate their own cavities but they will occasionally use nest boxes. I've never had them nest in a nest box but have had them excavate wood shavings placed in the box. Red-bellied woodpeckers are well adapted to habitats with scattered trees. They are a bird of forests and woodlands and they do much of their feeding on trees. They are a common bird of suburban yards with mature trees. Red-bellied woodpeckers can be attracting to your feeding station by supplying any of the following. Peanuts are a favorite food of red-bellied woodpeckers. I often place a handful of raw shelled peanuts in a platform feeder for them and other birds. Red-bellied woodpeckers eat black oil sunflower seeds as well. Black oil sunflowers really are one of the best seeds for the most kinds of birds. I feed black oil sunflower seeds in a wire peanut feeder, hopper feeder, and a hanging platform feeder. Red-bellied woodpeckers will come to all three types of feeders but probably prefer clinging to the wire peanut feeder as it is similar to their natural feeding technique of clinging to a tree branch. Like all woodpeckers, homemade suet is their favorite food. It is a high energy food preferred by many birds. It is made with animal fat, peanut butter, oatmeal, cornmeal and wheat flour. I serve it in a hanging suet log. Use my recipe for making Homemade Suet and you will be sure to get lots of birds that relish it. Native trees that are preferred by red-bellied woodpeckers grow to a large size and tend to have soft wood that is easily excavated. Woodpeckers don't just need the trees for nesting, but also for foraging for food for their hatchlings. Alien tree species do not support insects which the birds need to raise healthy young. Native tree species support hundreds of insect species that feed our native birds. The best trees in Kansas for red-bellied woodpeckers as well as other native birds are the following. If you have alien species of trees in your yard, I recommend removing them and replacing them with native trees. 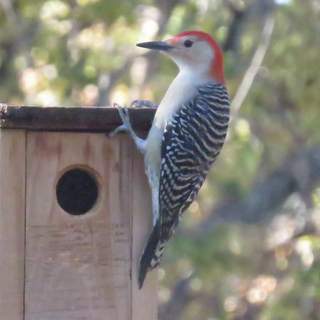 If you want to attract red-bellied woodpeckers to nest in your yard, put up a Nest Box designed for them. 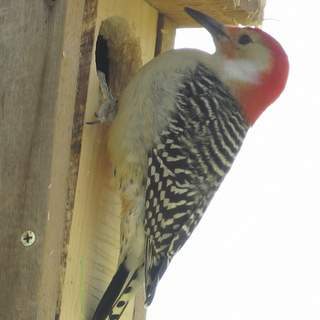 The nest box should be half filled with hardwood wood shavings to allow the woodpeckers to excavate their own home, as this is part of the courtship process. Soft aspen shavings are best and can be purchased at any store that sells animal bedding. Don't use softwood shavings such as pine or cedar as they are full of splinters which could hurt the young. Some suggesting filling the box full of wood shavings but this prevents the birds from roosting in the boxes during winter. The fact that they roost in the boxes may encourage them to nest in them as well. A nest box size based on naturally excavated nesting cavities is built using 4" and 8" planed one inch lumber available at any lumber supply store. Recessed base: 3 ½" x 5 ¾"
The box opens from the top. The top is held on with two screws, each kitty-corner from the other. One screw can be loosened to rotate the top open. This allows the box to be filled with wood shaving, aids in removing trapped starlings using a Nest Box Trap, and allows monitoring the nest box. Another size nest box that red-bellied woodpeckers may use has a larger interior. It is the size I use for Great-crested flycatchers and trapping European starlings. I've had Red-headed woopeckers nest in it which implies red-bellied woodpeckers may as well. Base: 5 1/2" x 6"
I'd suggest building more than one nest box as the extra nest boxes can be used to trap the invasive European starlings and may attract other native nesting birds such as great crested flycatchers. The method of mounting the red-bellied nest box is as important as the design of the nest box. Mounting to a tree is not a good idea, as squirrels will be attracted to it as well as predators. Furthermore a nest box mounted on a tree is difficult to monitor. A much better technique is to mount the box to a telescoping pole that attached to rebar. This allows the box to be located anywhere you can drive the rebar in the ground. It's important to locate the nest box in an area with a clear flight path to the box. The ¾" conduit is attached to a 4' length of #5 rebar. First the rebar is driven into the ground with about 1 foot above ground. Place the conduit over the rebar. Besides putting up a nest box, you will need to implement Starling Control as the starlings will prevent red-bellied woodpeckers from nesting successfully. Starlings seek out woodpeckers that are excavating a nest cavity. They will harass the woodpeckers until the they abandon their cavity. They are more aggressive than red-bellied woodpeckers and are very persistent. In our cities and towns the starlings out number the woodpeckers greatly. The red-bellied woodpeckers just don't have a chance against the huge numbers of starlings. If you have a suet feeder, you probably know how many starlings visit your neighborhood. To control starlings that are trying to steal the red-bellied woodpecker's nest box, place a second equivalent nest box about six feet away. Place a Nest Box Trap in the second nest box. When a starling tries to steal the red-bellied nest box, it will find the second empty next box. It should enter it and be captured by the trap. Here are some accounts of starlings stealing nest sites from woodpeckers. House sparrows also compete for cavity nesting sites and are very aggressive. House Sparrow Control details methods of trapping house sparrows. The closest I've had to red-bellied woodpeckers nesting in a nest box is having one excavate a nest box and reshape the entrance hole. I've also seen them inspect other nest boxes.